‘Listen to another parable. There was a man, a landowner, who planted a vineyard; he fenced it round, dug a winepress in it and built a tower; then he leased it to tenants and went abroad. When vintage time drew near he sent his servants to the tenants to collect his produce. But the tenants seized his servants, thrashed one, killed another and stoned a third. Next he sent some more servants, this time a larger number, and they dealt with them in the same way. Finally he sent his son to them. “They will respect my son” he said. But when the tenants saw the son, they said to each other, “This is the heir. Come on, let us kill him and take over his inheritance.” So they seized him and threw him out of the vineyard and killed him. Now when the owner of the vineyard comes, what will he do to those tenants?’ They answered, ‘He will bring those wretches to a wretched end and lease the vineyard to other tenants who will deliver the produce to him when the season arrives’. The vineyard is the people. God is all the time caring for his people and thinking of us. Making sure we’re not endangered when he can help it. His care for his people goes into the heart of Divine life, and of the Trinity becomes one of us, for our sake. He wants us to bear fruit as in the second reading (Philippians 4:6-9). 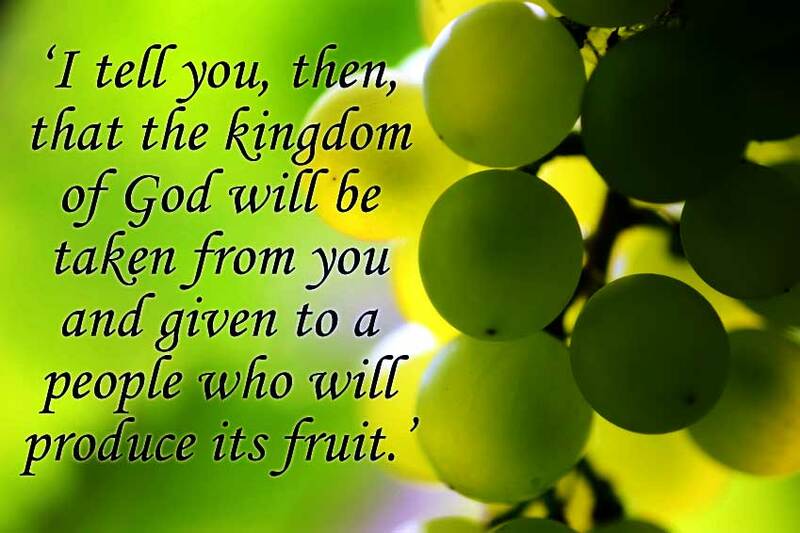 He will give these fruits – and will want us to value them. What are the values of our society now – child protection is better, and the church among the safest places now for a child. We are more inclusive of others, and of people who differ from us and the church is open to the whole human family. In Ireland we have more peace now than we had, but not maybe more justice. These are fruits. We miss out on some issues – the value of faith and community is low and sometimes in public political life we go for the temporary and the illusory and the dramatic. The gap of rich and poor is wider than ever. We have had bad experiences of greed and financial abuse which seems to be addressed badly still. What is the cornerstone of our country, what is the nourishment of the vineyard that is Ireland? Where is Christ and is his gospel becoming too secret? The cornerstone of the christian way of life is love, and the love is a person in Jesus. He is the one who will invigorate the vine. Some will kill him, some will follow. All of us are probably a bit in-between. God sent his own son into the trap of human life not because life is perfect, but because love is. This entry was posted in Gospel of Matthew, Gospel Reflection, Liturgy Resources, Prayer Resources, Scripture and tagged Donal Neary SJ, Gospel Reflection, Jesus, keystone, Kingdom of God, Love, Matthew 21:33-43, parable, Sunday Gospel and Reflection for 5th October 2014, Sunday Scripture and Reflection for 26th Sunday Ordinary Time Year A, Sunday Scripture and Reflection for 27th Sunday Ordinary Time Year A, vineyard.